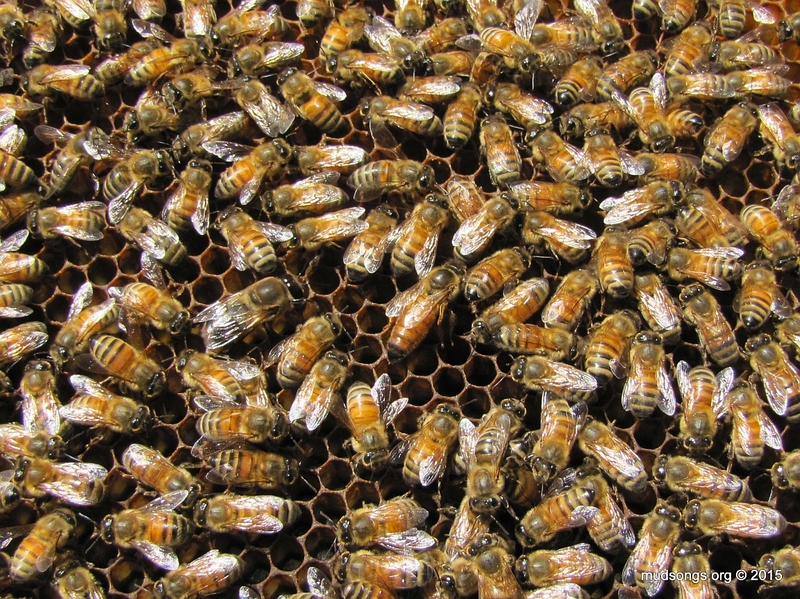 Split #1: The new queen DEAD inside her opened cage and several capped supersedure cells. Today (18 days later): A naturally mated queen, because Life Finds a Way. Happy Ending #1, or as good at it gets anyway. Split #2: The new queen alive and one supersedure cell full of royal jelly. Five days later: Fresh eggs and supersedure cell gone. Happy Ending #2. SHORT VERSION: I inadvertently created a walk-away split on July 18th when I removed some brood from an established colony to make a nuc. I would have much rathered that the mated queen I gave the bees hadn’t been killed by the bees, but that’s another story to be continued as a video at a future date. 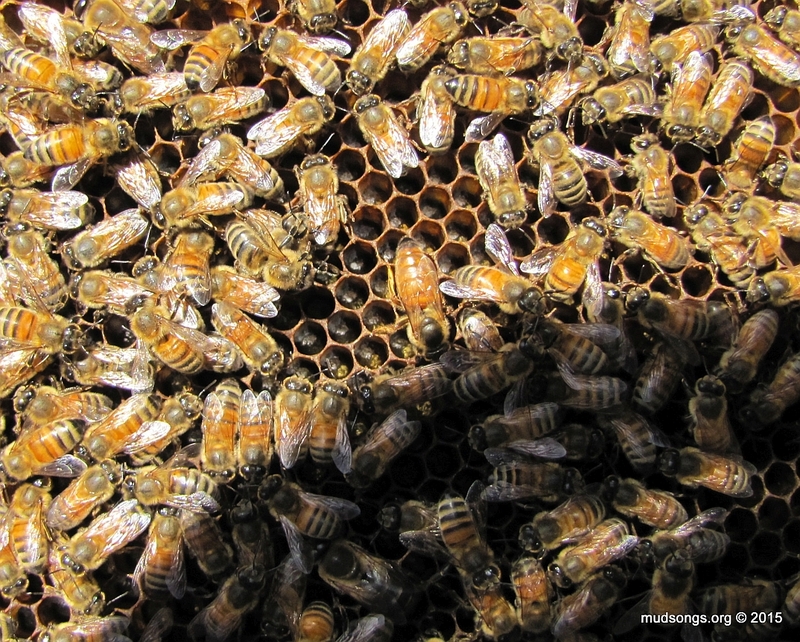 LONG VERSION: The answer to my previous post — Bees Returning with Pollen – A Sign of a Queen? — is yes. I found a big fat brand new queen in a hive that was queenless 18 days ago. Or as Dr. Ian Malcolm said in Jurassic Park: “Life breaks free. It expands to new territories and crashes through barriers, painfully, maybe even dangerously. But… well, there it is… I’m simply saying that life… finds a way.” You better believe it. If we return briefly to the beginning of this story, 18 days ago on July 18th (A Requeening Gone Bad), we learn that a mated queen was added to a split about 23 days ago and five days later, the mated queen was found dead in her cage along with several open and capped supersedure queen cells. I didn’t touch the hive until today when I noticed a few bees bringing in pollen. Foragers don’t usually collect pollen unless they have a reason to do so, and that reason is usually to feed a queen bee and her brood. So I decided to take a peek inside and low and behold, I found a new queen scooting around one of the frames looking for a place to lay. 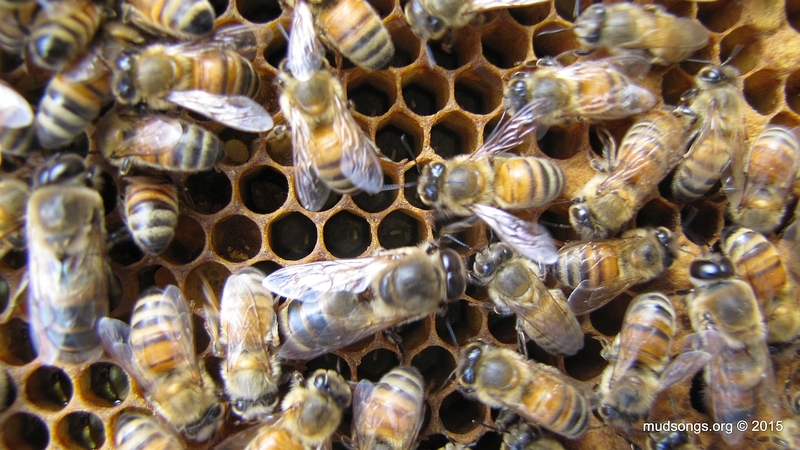 Bees Returning With Pollen – A Sign of a Queen? The drama never ends in my beeyard. It’s been 18 days since I found the dead mated in her queen cage in one of my hives, where I also found capped supersedure cells (see A Requeening Gone Bad). I haven’t touched the hive since. Today I noticed some honey bees bringing in pollen. If you look closely, you can even see it in this cellphone snapshot. I’ve been told by many beekeepers that foragers don’t bring in pollen unless they have a viable queen. Does that mean this colony has a queen? A capped supersedure cell from 18 days ago would have produced a queen by now and, who knows, maybe she even mated successfully. I’m heading out now to take a look. I better not find another invisible piping queen. Continued in Life Finds a Way. Supersedure cells in a recently requeened colony (July 18, 2015). 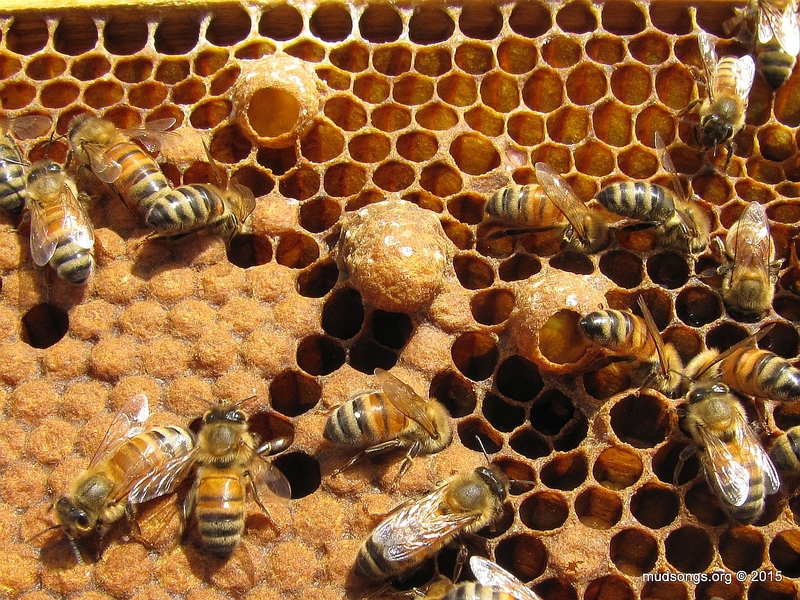 Split #1: The new queen DEAD inside her opened cage and several capped supersedure cells. Split #2: The new queen alive and one supersedure cell full of royal jelly. Split #3: The new queen M.I.A. (possibly dead) and several capped supersedure cells. P.S. : I say supersedure cell, but I suppose the more accurate term is “emergency queen cell.” Supersedure cells are created when the queen is failing but not yet dead, whereas emergency queen cells are created when the queen is suddenly dead. I think. Maybe. The difference seems so minimal to me, I always say supersedure. Furthermore, the presence of swarm cells means the bees are going to fly away, but presence of supersedure cells means they’re simply replacing a failing or dead queen. That’s how I sort it all out anyway. JULY 23/15: I did a quick inspection of Split #2 and found a few frames of fresh eggs. Woo-hoo! The supersedure cell full of royal jelly is gone too. Way to go bees! All of this will be revealed in detail with a video and photos that are in the works. 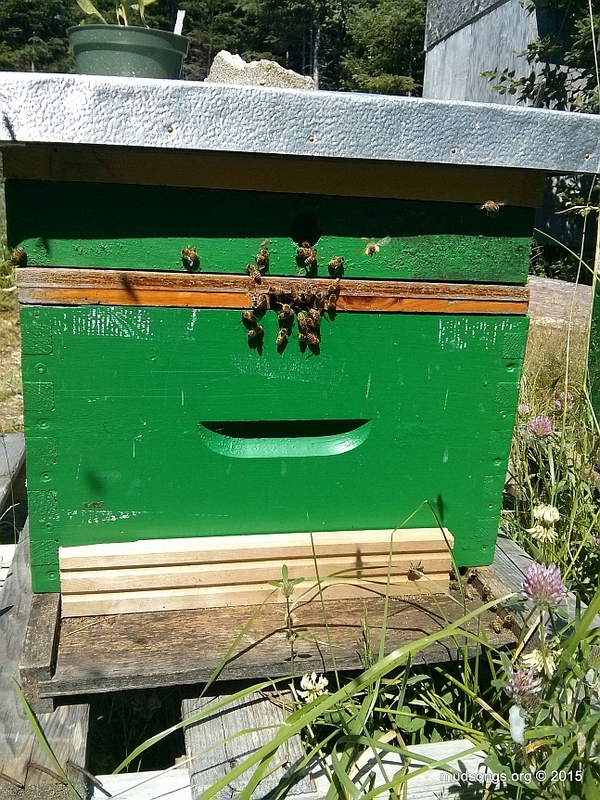 AUGUST 05/15: Continued in Bees Returning With Pollen.